There is a certain uniformity to the layout of the typical law office: once beyond the reception area, a prospective client often finds themselves chatting with a lawyer who, sitting behind a large, polished wooden desk, is surrounded by walls lined with books, plaques and certificates. Closer inspection of the décor reveals several prestigious looking awards, commendations and degrees, impressing the client with the lawyer’s sophistication, education and experience. Reassured that they have found a qualified lawyer, the client often goes on to hire the firm, confident that such an esteemed office can deliver only impressive results, well worth whatever expense might be required. What the client might not know, however, is that much of what they have seen could be the result of a carefully tailored image, garnered not by genuine qualification, but by paid promotion. The organization known as the American Society of Legal Advocates presents itself as a reputable collection of respected and qualified attorneys – at least at first glance. Their website appears professional, their logo impressive, and they even provide their member attorneys with ornate walnut plaques to hang in their offices. But how do they stand up to scrutiny? In this regard, at least, the ASLA appears quite satisfactory – naturally one of the most suspicious indicators of a dubious commendation would be the inability to locate the awarding organization online. Since the ASLA does not lack in this field, no more time will be spent on it. Here, a close inspection of the selection process for member attorneys begins to raise alarms: while ASLA suggests that their lawyers “comprehensively review information for each candidate,” no standards for this review are provided. Instead, clients are left to wonder as to the quality of websites which are acceptable, what percentages of verdicts must be guilty or not guilty (or why), how settlement information is judged without a comprehensive understanding of the case, and so on. In short, readers are offered a few jumbled legal terms, but no information as to the substance of the qualification process. Here, the ASLA certainly fails this examination. At this point, clients should certainly become alarmed – the only information provided by the ASLA website as to who selects members and determines whether they qualify for membership is the ambiguous group of “ASLA’s lawyers.” No names are given, no bar numbers, no credentials whatsoever. Readers are left wondering if there are a specific group of lawyers within ASLA who make the determination (and why they might have been so entrusted with that responsibility), or whether the organization as a whole evaluates every potential candidate. In any event, the complete lack of transparency or apparent credentials of the selector qualifications certainly marks this organization as a suspicious one. Now it would be truly ludicrous for an organization such as ASLA to publicly announce that payment was required in order to obtain a membership – and the walnut plaque, of course – as it would expose the organization far too obviously. Yet, while there is no direct indication of an admission fee on the website, there are certain indicators. The first and foremost is the membership login; or more specifically, the “Confirm Membership,” button found on every page with the membership login. Although this does not outright announce a membership fee, it does represent a certain eagerness to enroll members that suggests a financial incentive on the part of the organization. More telling still is a cursory search of the member attorneys – as of the writing of this article, only a single attorney appears in the “top 100” criminal defense attorneys for the State of Utah. This suggests that nearly all Utah attorneys are unwilling to be members of the organization – something which would seem unlikely, were membership free. 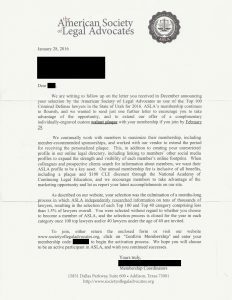 Of course, it is no coincidence that ASLA was selected as a prime example of a promotion organization which simply requires payment of an annual fee for membership, as the adjacent recruitment letter suggests. 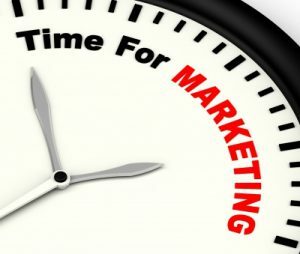 Over the course of the last decade, many – if not most – marketing websites have begun to assign ratings to their products, partners and participating professionals. These ratings are based on a variety of factors – from customer reviews to awards and recognitions – and for attorneys today, ratings on many websites are quite similar. Yet each website operates its own rating system with its own particular nuances and requirements, so it makes sense for clients searching for attorneys to learn exactly how attorneys receive their ratings on the various websites – and, more importantly, how significant the ratings should be considered when hiring an attorney. One popular example is the website, Avvo. This enormous center of legal professionals (they claim to have some 97% of all lawyers in the United States represented in some way on their website), Avvo also gives at least a hint of how their rating system works. For the most part, it seems to be what one would expect: they assign a rating to each attorney by gleaning public sources for information on commendations and disciplinary actions, evaluating attorney websites and examining information provided by the attorneys themselves on their Avvo profiles. Less expected is the inclusion of what Avvo refers to as “peer endorsements,” when calculating ratings; that is, adjusting a rating for an attorney based on whether or not their peers have posted public reviews on their Avvo profiles. This factor seems particularly unusual as the reviewing peers must themselves claim Avvo accounts before they can review their peers – no doubt a very successful advertising tactic for the website. Finding an attorney today is an easy task – finding the right attorney, on the other hand, can be profoundly difficult. A great deal of information is available to prospective clients, and with it, a great deal of misinformation. Always use caution when evaluating an attorney off an apparently prestigious commendation or high rating, no matter where it appears: you may inadvertently find that you have retained an attorney who is, as the saying goes, all bark and no bite.